No one is certain of who O’Quinn was named after. The most likely source was an Irish immigrant while other sources state that it was a Indian chieftain by that name. O’ Quinn’s history is typical of the rest of Fayette County. Immediately after Texas Independence, the region was predominately Anglo American. 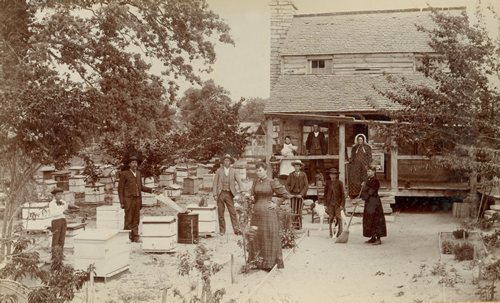 Beginning in the 1840s as German immigrants moved in, the Anglos sold off their land and moved west. 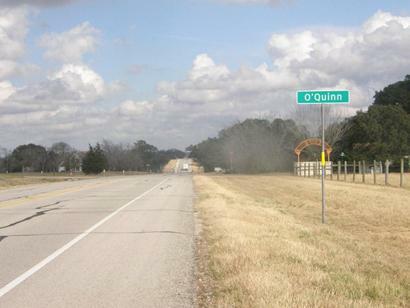 Because of it’s proximity to the county seat of La Grange (as well as many nearby communities) O’Quinn had little chance for growth. 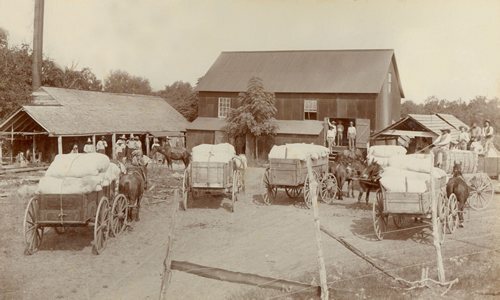 In the early 1880s the community was granted a post office and when the 20th century arrived – O’Quinn had a blacksmith, a cotton gin and two stores. 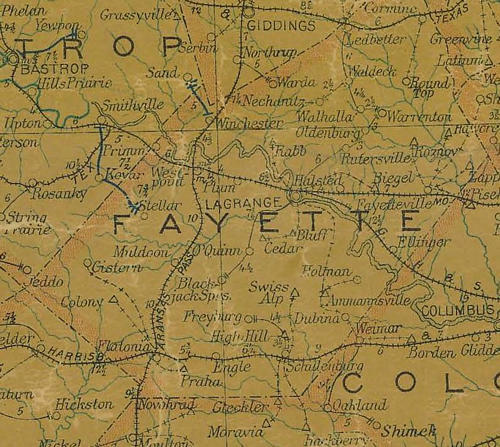 The cluster of villages in this part of Fayette County attended church services in towns other than O’Quinn and voted in nearby Black Jack Springs. Although it is now hard to imagine, this village used to have two fraternal lodges. In 1911 the U.S. Postal Service gave up on O'Quinn and discontinued the post office. La Grange took over delivery to La Grange. The census count in 1950 was twenty-five residents – about the same as 2000. Only a single business remained open at this time. The planting of cotton, which had been the principle crop, was discontinued in the 1960s. Today the land is used for the production of hay or grazing cattle. In 2010 there is a signage business and not much else. While the official count is a mere 25, there are four times as many weekenders from Houston and San Antonio. 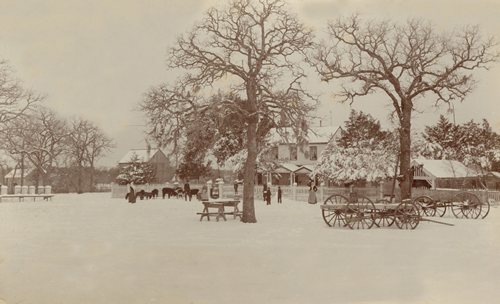 Photographer John Melcher, whose vintage photos appear on this page, lived in O’Quinn in the late 1900s. As a result, the Melcher collection is the crown jewel of the Fayette Heritage Museum archives. 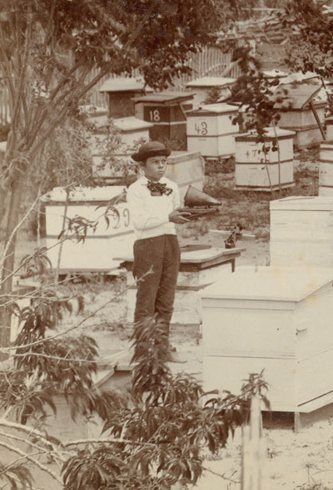 Boy holding a "smoker" - a bellows and metal cone that held a smoldering cloth. The smoke tranquilizes the bees - allowing the hives to be "robbed" of honey. 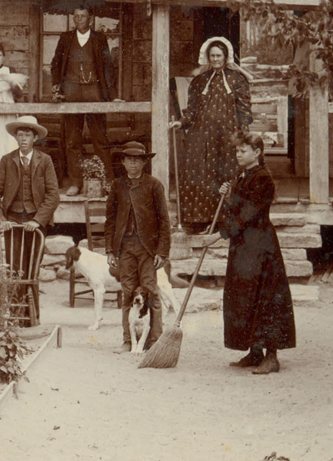 Detail of top photo showing a girl "sweeping the yard" - a common practice, but one seldom photographed. Her brother demonstrates a popular method of getting dogs to pose for photographs.